Update: 26th August Massive thanks to Magic Box for this full translation. 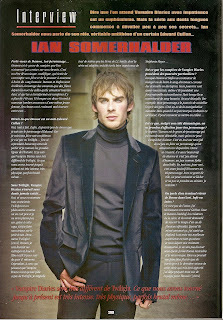 Would you say that Damon is an anti-Edward Cullen? Do vampires from Vampire Diaries possess particular powers? In spite of his demonic side, will we get to love your character? I hope so! Damon is the kind of person that is morally appalling, but that we can’t help to love. In any case, it’s my job to turn him into someone we don’t want to see disappear. Beyond his cruelty, he also possesses a lot of charm and doesn’t come without a sense of humour, somewhat like Spike in Buffy. Anyway, for me it’s kind of orgasmic to personify such a character. With that kind of role, we can really get loose and not take ourselves too seriously. I’m having fun! There are talks about Boone eventually returning to LOST. True or false? It’s not false. I’ve recently met with Carlton Cuse and Damon Lindelof, the creators of the show, and they’ve asked me to come back for an episode or more. When they told me that, I jumped in the air. LOST remains my best experience as an actor, and my departure was really traumatising for me. I don’t know in what form or shape Boone will be back, and I don’t care. Nothing could have pleased me more than to take part of the last season of the show that has brought me so much. I’ve already prepared my luggage! [laughs]. Thanks to Franzo for the following.